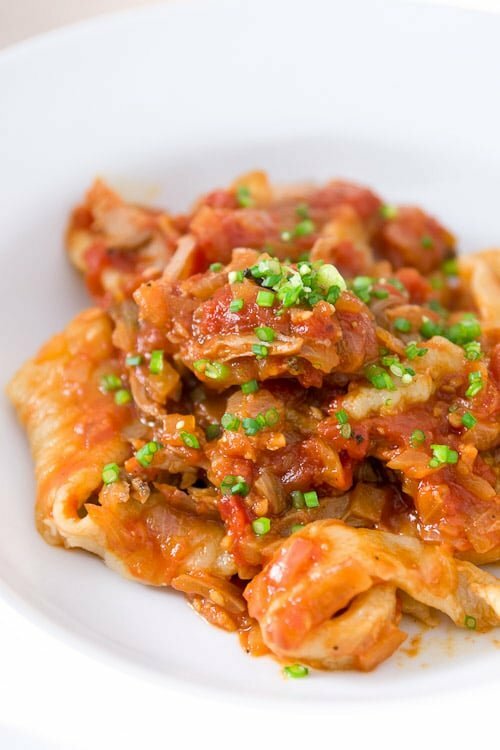 This five spice duck confit ragù with hand pulled noodles melds Chinese, French and Italian techniques to make a truly unique dish. Humans have been migrating all over the world for tens of thousands of years, first on foot, then by caravan, and eventually across vast oceans on ships. This was at a time when much of the world was unknown and most couldn’t comprehend what lie more than a day’s travel from their homes. Migrations were reserved for the most dire of situations and could take years, or even generations to make. The slow pace of travel resulted in many insular groups of humans developing their own culture and traditions with little to no influence from the outside world. With each progressive step forward in transportation technology such as the steamship, the automobile and the jet plane, humans have able to move around en mass, cheaper and faster than ever before. Ironically, in a time when we can reach the opposite end of the world in less than a day, there’s been an accelerating trend towards homogenization. Tea drinking cultures are increasingly becoming coffee drinkers, cuisines with a historical reliance on the sustainable bounty of the ocean are turning to hamburgers, and ancient family recipes are being lost with the passing of a generation. In a few centuries, it’s conceivable that regional boundaries will have become so blurred that we may refer to distinctive cuisines by era rather than by region. It’s a scary thought, but I’ve never been one to stone-wall progress, so this Five Spice Duck Ragù is my first in a series of recipes I hope to feature on where i think food may be headed in a few generations. I’ve used techniques and ingredients from a handful of countries, including China, Italy, Japan, and France to come up with a dish that doesn’t sit firmly in any one of these countries, driven more by taste, rather than loyalties to any one cuisine. This dish starts with a duck confit that’s cured in salt sugar and spices for a few days, which draws out excess moisture, and concentrates the flavours of the duck. The cured duck legs then get braised for hours in a pot full of its own fat. Originally used as a way of preserving fruits and meat in France, confit is a great way to cook tougher cuts of meat without drying them out. This recipe makes 4 duck legs, but since you only need 2 for the pasta, you can save the other two for another pasta meal, or just toss them in a pan with some duck fat and fry them until they’re golden brown on the outside and the skin is nice and crisp. The sauce is much sweeter than a typical ragù, and this is the Japanese influence. I like the fact that the sweetness offsets the tartness of the tomatoes and the saltiness of the duck. It also compliments the sweet spices like cinnamon, clove and star anise. If you’re a pasta purist, you probably won’t be interested in this recipe anyway but you can make your sauce less sweet by omitting the honey from the sauce. As for the pasta, I’d originally planned to show you how to make hand-pulled Uyghur style noodles, but it’s a technique I’ve yet to master, so until I have the technique down, I’d suggest using some other kind of pasta (fusilli or udon would work well). Make sure you cook them al dente as they will absorb more liquid when you toss them with the sauce. Wash and thoroughly dry the duck legs with paper towels. 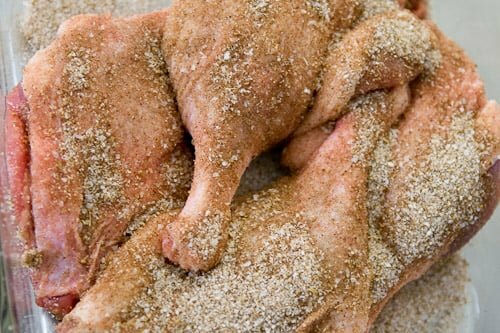 Mix the salt, sugar and five spice powder and sprinkle it all over both sides of the duck legs. It may look like a lot, but the idea is to draw out some of the water and concentrate the flavours, so it will turn out just right. Cover the duck legs and let it cure overnight, or up to 2 days. When you're ready to make the confit, lightly rinse the duck legs under cold water to remove some of the excess spice and salt. Dry them very well with paper towels and place them in a very heavy walled pot with a lid, such as a dutch oven. Cover the legs with enough rendered duck fat so that none of the legs are peaking out. Put the pot on a stove and bring the heat of the oil up to about 160 degrees F (this will speed up its time in the oven). Turn the oven on to 200 degrees F, cover the pot and put it in the oven. You want to cook the legs slowly for about 4-6 hours, or until a skewer goes right through the legs without much resistance. Once the confit is done, you ideally want to let it rest over night in the fat, in the fridge, but you can proceed to the next step if you're pressed for time. 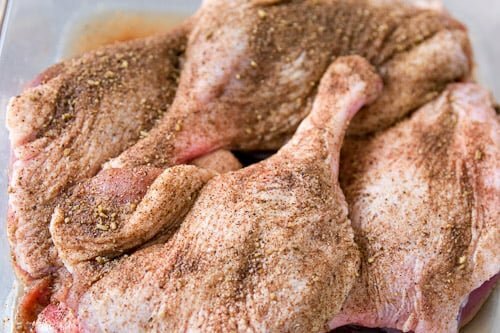 Remove the bones from two of the duck legs then break up the meat into bite sized pieces. Save the other two legs for another use, they'll keep for a few months in the fridge as long as they're submerged in the fat. Heat a heavy bottomed pan over medium heat until hot then add the duck. Quickly brown on one side and transfer the duck to a plate. Add the onions and garlic and sauté until soft and lightly browned (you can add some extra duck fat if you need it). Add the cinnamon, star anise and cloves to the onions and fry for about another minute until the spices are fragrant. Use your hands to crush the tomatoes into the pan and pour in the juices. Scrape up all the browned bits on the bottom of the pan with a spatula and add the honey and lightly season with salt and pepper (remember the duck has salt in it too, so be careful not to over-salt the sauce). Cook the sauce, maintaining a gentle simmer for about 20 minutes, if the sauce starts getting too thick, add some white wine, or stock, but you want the sauce to be pretty thick. Add the duck confit at the very end, then taste for salt and make adjustments as necessary. Spoon half the sauce into a bowl with the cooked pasta and toss to coat. Plate the pasta and cover with more sauce, then sprinkle the garlic chives on top to garnish. I love duck ragu with pasta! Do you ever make your own five-spice powder? I was wondering what the ratios would be. Thanks! Wow, that looks awesome, loved the flavor combination. And my bout of vegetarianism was going so well… I know! I’ll keep this until Thanksgiving where cheating is mandatory.May have to try it with fried tofu and see if it still has a good flavor. Love everything going on here Marc. You definitely know how to take the best elements from every culture and blend them harmoniously. The five spice is brilliant. The scent of five spice powder is so distinctive. That sweet, smokey, spicy scent is a little intoxicating. 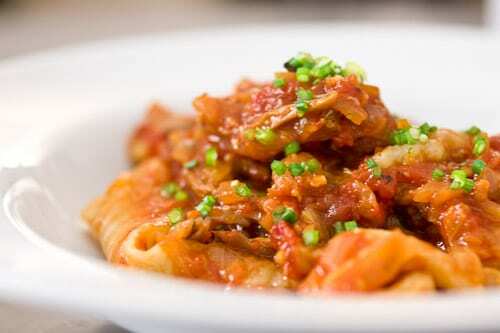 Love this flavorful ragu. This sounds amazing! Wonderful for slowly creating food in the winter. ducks in malaysia is one of the most preferred food by Chinese people. roast duck is their favorite food. Duck meat has a very sweet. I really like it. ** thank you because you are willing to share this recipe. love this asian version of the italian duck ragu which we did recently! very cool similarity (yet difference). how awesome that things that can be translated one way can completely be transformed into another way! beautiful flavors! And my bout of vegetarianism was going so well… I know! I'll keep this until Thanksgiving where cheating is mandatory.May have to try it with fried tofu and see if it still has a good flavor. Now I know why I woke up last week with a huge craving for duck ragu!It was like this totally inexplicable craving and I just couldn’tfigure out where it came from, so I went and picked up duck legs atthe butcher on my way home from work. Thanks for the inspiration! Be still my beating heart! I’m in love. Now I know why I woke up last week with a huge craving for duck ragu!It was like this totally inexplicable craving and I just couldn'tfigure out where it came from, so I went and picked up duck legs atthe butcher on my way home from work. Thanks for the inspiration! Not crazy about duck, unless it’s roasted duck breast, pink inside. Never had it like this before but I could be easily convinced with such a gorgeous recipe – and that colour is just stunning! Be still my beating heart! I'm in love. this looks phenomenal… such good comfort food! Uyghur noodles — are those Mongolian? i like the sweetness aspect of it too – a Japanese imprint on an otherwise Western dish. Looks filling and warm – and now I want it for breakfast! This is right up my alley and makes me think of an extension to Wafuu Pasta since there may be even more influences going on here. The aroma in your kitchen had to have been intoxicating and I remember you tweeting about the smell of the marinade…I believe it. Oooh yummy yum yum – this I could eat right now! Not crazy about duck, unless it's roasted duck breast, pink inside. Never had it like this before but I could be easily convinced with such a gorgeous recipe – and that colour is just stunning! Unbelievable – you have a knack for putting fusion dishes together, taking it to a whole new (Michelin) level! Wow, it looks awesome! Hearty and delicious ragu … the addition of 5 Spice is such an interesting twist. Duck is always my favorite and this preparation sounds absolutely fabulous! I love the five-spice seasoning! I admire your project to rediscover and contrast food history from different regions. I am looking forward to making a first attempt at duck confit with your recipe. It looks excellent! I’ve been fascinated with new and different duck preparations lately, and this looks fantastic! The flavors sound great with duck, and it’s a nice, hearty ragu for pasta. I've been fascinated with new and different duck preparations lately, and this looks fantastic! The flavors sound great with duck, and it's a nice, hearty ragu for pasta. I love a good duck confit. Just melts in your mouth. Add wide, tender pasta to the mix and it’s a recipe for pure deliciousness. Love the Asian twist on this European classic. I love a good duck confit. Just melts in your mouth. Add wide, tender pasta to the mix and it's a recipe for pure deliciousness. Love the Asian twist on this European classic. …and lead us not into Temptation… Marc between you and the Zen Chef, I have to be constantly praying not to be tempted to go shop and cook, cook, cook. adding cinnamon sounds lovely! I’ll have to try it! adding cinnamon sounds lovely! I'll have to try it! I have to try ragu with duck! This looks and sounds really good. Love the 5 spice here. Love love love this dish! Well, really anything with five spice – but this looks amazing! Thanks for sharing. Oh wow – this looks amazing! The ragu recipe sounds delicious!